In case you are in a hurry or are not interested in the in-depth technical stuff you can just read though this brief review to get a high level scoop on recently released Kindle Touch. Noticeably smaller than Kindle Keyboard (KK/K3) and 0.5oz lighter. Just a notch larger (hardly noticeable) than Kindle 4 Non-Touch (K4NT) and 1.7oz heaver. Exactly same eInk Pearl screen as in Kindle Keyboard and Kindle Non-Touch (verified with colorimeter). Unlike backlit screens of tablets, eInk reads like a paper, so it is very readable in direct sunlight. On the other hand you will need a light to read from Kindle when it is dark. Some options include leather cases with built in lights and clip-on lights. Touch works based on infrared sensors so nothing is overlayed on top of the screen preserving its contrast. Long battery life of up to 2 months on a single charge. Text-to-speech can read your eBooks and (!!!) PDF documents to you via built-in speakers or headphones. Whispersync will automatically synchronize reading position between all your Kindle devices and apps so you can seamlessly read one book on many devices. Audiobooks from audible are downloadable directly from the Web and playable on Kindle. No computer required. Built-in dictionary to look up definitions and translations of words in books and documents. You can also look up things in Wikipedia. Unicode support allows reading books in many languages, including Russian, Japanese, Chinese, Korean. Native support for PDF, MOBI, PRC, TXT and HTML. Other document types can be loaded onto Kindle via Amazon online conversion. Compared to previous Kindle versions PDF support has been improved. More than 1,000,000 in-copyright books available for purchase. Wast majority of these for $9.99 or less (including most of New York Times bestsellers). On top of these there are also around 2 million out of copyright books available for free. First chapters in any book are available to read as free samples. You can check out books from your local community library. For Amazon Prime subscribers it is also possible to loan books from Amazon library for unlimited time. Newspapers, magazines and blog subscriptions are automatically wirelessly delivered to Kindle Touch. 4 gigabytes of built-in flash memory can store up to 3,500 books at the same time. All eBooks that you buy from Amazon can be downloaded as many times as you like to your Kindle, PC, iOS, Android, Windows Phone 7 and other reading apps. Social features include Twitter and Facebook integration along with the ability to share book highlights and see passages that other people most frequently highlight in a book that you are reading. WebKit-based browser that can easily open complex web-applications such as GMail. Now lets take a deeper look at all o the aspects and features of Kindle Touch and how it compares to two other 6″ eInk devices – Kindle Keyboard (KK) and Kindle Non-Touch (KNT). I will refer and compare Kindle Touch (KT) a lot to these devices in the course of this review. It is amazing how quickly we can become spoiled, especially when comparing things. Kindle 3 felt significantly lighter when compared to Kindle 2. Kindle 4 Non-touch felt like a feather compared to Kindle 3. As I hold all 3 current devices (Keyboard, Non-touch and Touch) and compare, I can clearly feel the difference in weight. Kindle Fire that also lays in front of me feels like a brick when compared to eInk devices. Yet the truth is that all 6″ eInk devices (and perhaps even 9.7 Kindle DX) are light enough not to bother you during prolonged reading. It takes reading for more than an hour on something as heavy as original iPad for my hand to go numb. According to Amazon Kindle Touch weights 7.8 with 3G modem and 7.5 without. My electronic scale actually put 3G version at 7.6oz. It seems like Amazon is systematically overstates weight of their devices starting from Kindle 3. To put this into perspective, Kindle Non-Touch weighs 5.9oz, and Kindle Keyboard – 8.5oz. Of course Sony PRS-350 is smaller and lighter still at 5.3oz but at a price of having a smaller screen. Kindle Touch is just a notch larger (6.8″ x 4.7″ x x 0.40″) than it’s non-touch counterpart (6.5″ x 4.5″ x 0.34″) and smaller than Kindle Keyboard (7.5″ x 4.8″ x 0.34″). Weight and size difference can most likely be attributed to increased battery capacity. Flipping pages Touch page flipping area or swipe. Either forward or backward page turn can be accomplished one-handed. Excellent experience. Press page turn button. You can page forward and backward one-handed. Excellent experience. Same as Kindle Keyboard. Excellent experience. Finding a book or location within a book by keywords Couple of taps to open search box and then you can type on on-screen touch keyboard which is rather responsive. Couple more taps to select search context if needed. Two hands required. Good experience. Just start typing on the physical keyboard. Search context easily selectable with 5-way controller. Two-handed operation. Best experience. Invoke on-screen keyboard with physical button and “type” by selecting letters with 5-way controller. You can still use just one hand (though using two is more comfortable). Overall it is a slow and tedious process. Look up word in a dictionary Touch the word and hold for a short time. Can be one- or two-handed operation depending on where the word is on the page. Excellent experience. Use 5-way controller to select the word on a page. Can require a lot of clicking. One-handed operation. Overall acceptable experience. Use 5-way controller to select the word on a page. Can require a lot of clicking. Doing this one-handed is not as comfortable as with Kindle Keyboard because 5-way controller is located in the middle of the device. Overall acceptable experience but slightly less so than with Kindle Keyboard. Look up word in Wikipedia or Google There is no way to select a word or a phrase within a book to conduct a search. You need to type it on on-screen touch Keyboard. Less than optimal experience. Definitely two-handed Select word or phrase with 5-way, then press “Space” on keyboard. Use 5-way to select search context. Acceptable experience. Can be done one-handed. Alternatively you can just type the word on keyboard. Same as with Kindle Keyboard when it comes to selecting the word in a book, but instead of “Space” you need to press “Keyboard” button twice. Acceptable experience. Navigate via table of contents 3 taps to get to table of contents, then just tap on the chapter name to go there. Two-handed operation because 3 initial tap points are on top, bottom and center of the screen. Overall good experience Use menu and 5-way controller to get to ToC and then 5-way controller to select an item. One-handed operation. ToC is easier to get to but harder to navigate with 5-way. Overall good experience. Same as Kindle Keyboard but a bit more awkward because of central location of 5-way controller. Highlight a passage / share on social Tap, wait and drag to select the passage you want to highlight, then tap to confirm. Very convenient. Can be either one or two-handed operation depending where the passage is. Use 5-way to select start and end of the passage to be highlighted. Acceptable experience Same as Kindle Keyboard but a bit more awkward because of central location of 5-way controller. Go to next/prev chapter Swipe up to go to the next chapter, swipe down to go back to the previous one. Can be done with one hand. Excellent easy experience. Use left or right on the 5-way controller. Easy one-handed experience. Same as Kindle Keyboard but a bit more awkward because of central location of 5-way controller. As you can see, the most frequent operation of flipping a book page is equally comfortable on all devices. In other operations, touch and keyboard perform on par with each other. So it’s really a question of what you will do more often. If English is a second language for you and you will frequent the dictionary than touch will have an advantage. If you annotate with text a lot, then keyboard rules the day. Non-touch device will give you some minor trouble even in such basic operations like finding a book by name (among 100s of other books in your archived items) but it pays back for this inconvenience in reduced size and weight. As with Sony devices that pioneered eInk + touchscreen combo, there is a noticeable lag between finger manipulations and things happening on the screen. At first it seemed a little annoying to me but very soon I got used to it and stopped noticing it altogether. The convenience of selecting any word on the page by merely pointing at it is worth it. 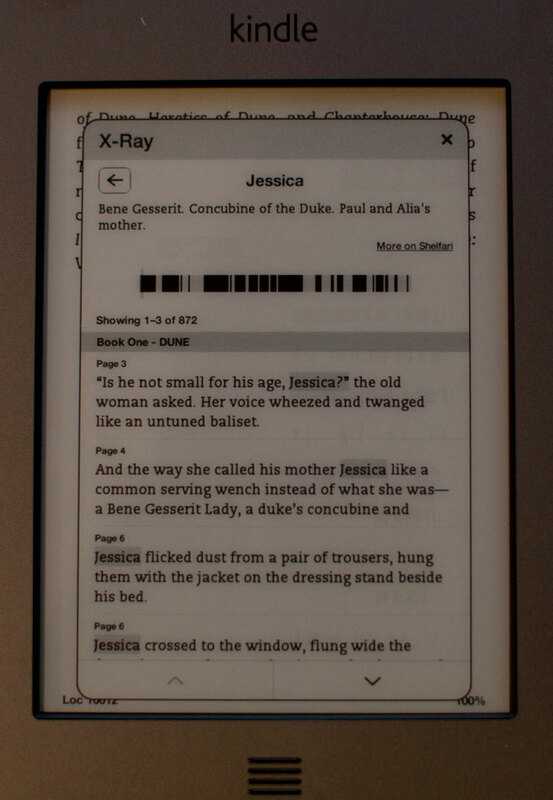 The screen in new Kindle Touch is the same eInk Pearl that Amazon has been using since Kindle 3. It is also currently used by Sony and Barnes & Noble in their PRS and Nook devices. It features resolution of 600 x 800 pixels and can display 16 shades of gray. It has higher contrast compared to older generations of eInk and quicker refresh time. Although some people on forums claim that screens look different, I tend to disagree. I’ve measured all 3 screens with colorimeter that is normally used for printer calibration and found the measurements to be close enough. Small discrepancies can be attributed to normal screen quality variance, different screen age and wear and minor measurement errors. The difference is so small that it wouldn’t be noticeable to a naked eye. This graph shows measurements of the L component of Lab color for 16 shades of gray, with “0” being total black and “15” being “total white”. “L” component is indicative of the brightness and disregards color information. “a” and “b” components were close to zero indicating almost neutral gray color with a slight greenish tint. Touch interface is implemented by infrared sensors located on the edges of the screen. This way nothing is overlayed on top of eInk avoiding low-contrast disaster that resistive tochscreen film caused in Sony PRS-600. IR touchscreen attributes to a slightly thicker bezel around the screen. I’m guessing that to conserve battery power, IR transmitters light up only few times a second until user touch is detected and then sampling frequency is increased. This can explain why there is a lag that is longer that can be attributed to eInk refresh speed and why very quick taps on the screen can be ignored by the device altogether (though not always). All-in-all eInk + Touch combo is not perfect but it does provide added convenience over keyboard and even more so over the lack of keyboard in non-touch version. Given my past experience with Kindle 4 dis-assembly (and how it turned out to be irreversible) I’m going to put off taking Kindle Touch apart to see what is inside, including the battery. Based on the device weight and claimed battery life, I’m guessing that it would have the same capacity as in Kindle Keyboard or more to accommodate for infrared touch screen power use. However I suspect that it might be of the same soft-case, glued-in non-replaceable kind as in Kindle 4 Non-Touch. My second Kindle Touch is scheduled to arrive on November 22nd and then we’ll know. 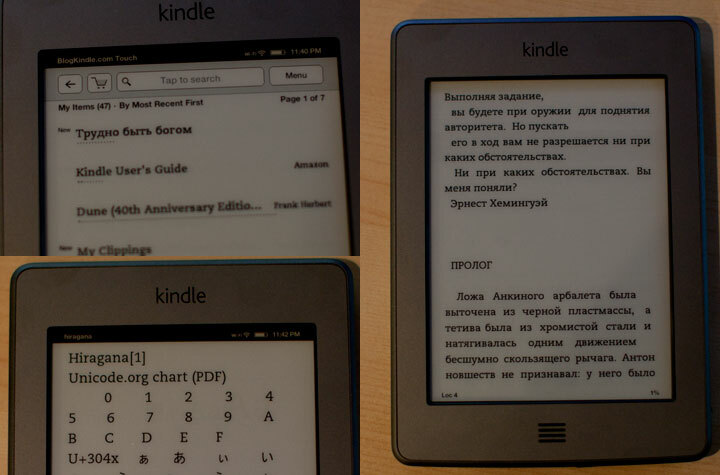 Just as in Kindle 3, Kindle Touch features unicode font support enabling users to read texts in non-latin languages such as Russian, Japanese, Chinese, Korean, etc. No hacks are required. I did some quick tests and confirmed that Russian and Japanese Hiragana definitely work. If the language you need is not supported you can always bypass this limitation by saving the document as PDF that has all of the fonts embedded. Using large fonts can be a great help for readers with impaired vision. Text-to-speech now works in PDF too. 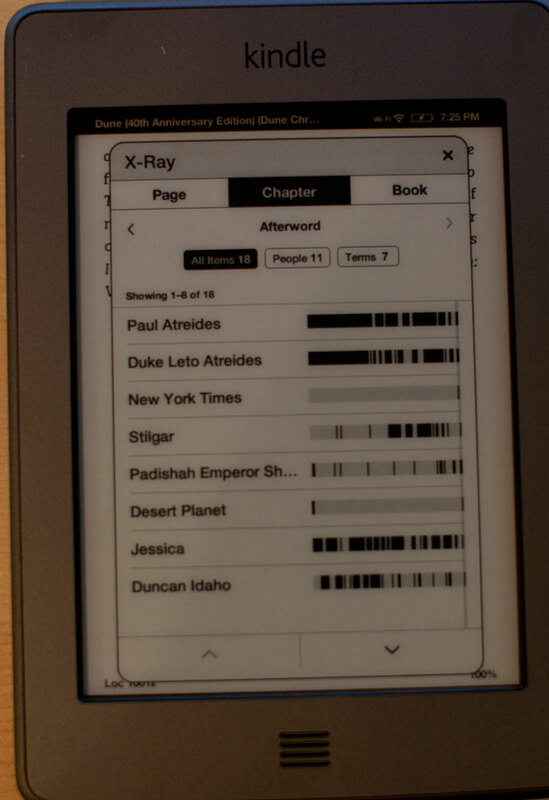 You can configure Kindle to do a full page refresh after each page turn to eliminate ghosting. By default this happens after every 6 page turns. Web-browser can access websites other than Wikipedia and Shelfari only when you are connected to WiFi (not via 3G). On the other hand you can access AT&T hotspots in the US for free. One of the areas that was reworked in Kindle Touch is PDF file support. Kindle finally added support for internal and external PDF hyperlinks. So things that were clickable in Adobe Acrobat Reader on PC are now clickable on Kindle. PDF documents became much easier to navigate. Another welcome addition was added support for structured table of contents that Adobe Acrobat normally displayed as a “tree-structure” to the left of the document. Kindle displays it as a flat menu. Again it makes documents easier to navigate. In the past one had to rely on search or “go to page…” command. These commands are still there and work well. Text-to-speech now works in PDF documents too. Unfortunately landscape viewing mode is no longer there which makes documents that were designed to A4 or US Letter paper size very hard or impossible to read without zooming. Pan and zoom is controlled by multi-touch as one would expect, but it is not as convenient as switching your 6″ Kindle into landscape mode and paging though the document. With Kindle Touch, once you zoom in, you loose the ability to flip pages (need to zoom all the way out first). Panningg is reasonably fast due to the fact that the viewer updates only half of the pixels on screen and even those in 2-color mode. Once you stop panning a full page refresh follows to eliminate ghosting and display the image in full quality. Found in UR, Frank Herbert’s Dune (though not “Dune’s Messiah”). This was one of the highly-advertised features during the Kindle Touch reveal back in September. It lets you browse though characters and concepts in the book and see where they are mentioned. The feature is based on shelfari Amazon community encyclopedia. Currently it is only available in a very limited selection of books. 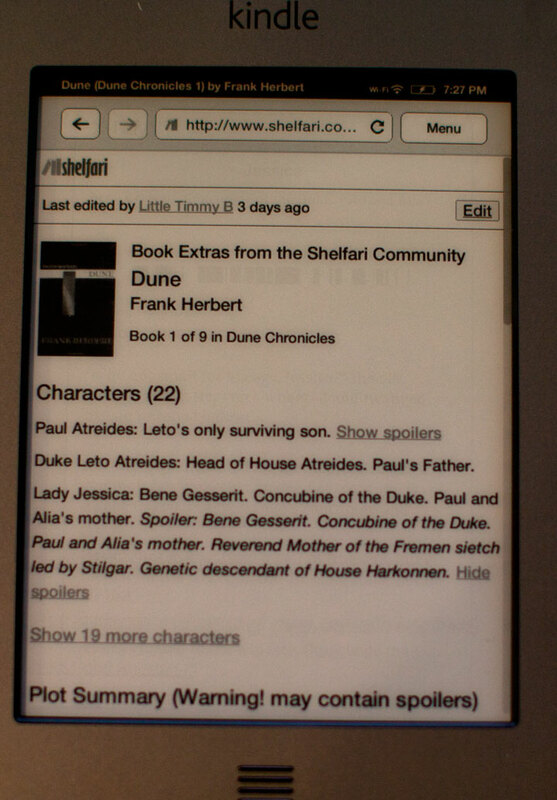 After randomly checking a few dozen of books in my Kindle library I found it working in Stephen King’s “UR” (that was written specifically for Kindle) and Frank Herbert’s “Dune”. What is interesting that it didn’t work in “Dune’s Messiah” which is a sequel. I found it funny that one of the entities in the “Dune” book was “New York Times” due to the fact that it was mentioned in the afterword. While technically this is correct, it is a bit misleading. Kindle has supported apps for quite a while. With introduction of Kindle Non-Touch and Kindle Touch, application market has split. Since Kindle Keyboard has been around the longest, most if not all Kindle apps work on that device. On the other hand, most currently do not work on Keyboardless devices due to poor user experience or complete inability to control the app without keyboard shortcuts. So each individual app may or may not run on every type of Kindle device. With time app developers will update their apps to support as broad range of devices as possible buy meanwhile you can enjoy playing Number Slide on Kindle Touch. Magazine reading layout was reworked to be more touch friendly and efficient. Font page now features 4 main articles chosen from different section. Either of these can be selected with a single tap. When content is downloaded you can see completion percentage ticking in real-time. It can be helpful if you are downloading something like 20 hours unabridged version of Tom Clancy’s “Dead or Alive” audiobook. Although officially Amazon is mum on HTML support, it is present. If you save HTML with file extension TXT into the documents folder, Kindle will open it and basic markup, formatting and hyperlinks will work. All-in-all, Kindle Touch is another solid eReading device from Amazon. Although previous incarnations of Kindle were already quite good at their main purpose, which is reading books and newspapers. That being said, touchscreen interface still does add some value even if to keep the device usable while making it smaller and lighter. As I was typing this review (more than 3000 words as it turned out), 23 user reviews were already posted on Amazon, more than half of them are 5-star reviews. With purchase price of $99 (though I’d recommend making a one-time $50 investment to get lifetime free 3G) Kindle Touch provides great value (especially considering the ability to get books for free from library (either your local one or Amazon Prime). If you will find sponsored screensavers annoying, you can always pay $30 that you saved during the initial purchase to amazon to have them removed. Asus has this strategy of throwing everything against the wall and seeing what sticks. So earlier this month Asus officially acknowledged that they have an e-Book reader in the pipeline. 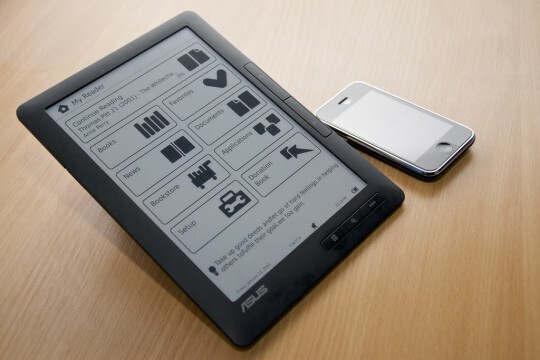 There were rumors about an Asus e-reader that has a 5inch OLED screen that carries the model number DR-570. But this is called the DR-950 and it has a 9inch e-Ink display. 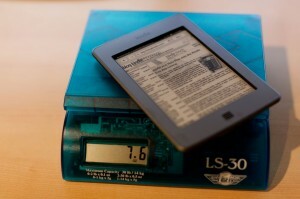 The same kind of display that is used on the Kindle. It has a resolution of 1024×768 and has support for ePub, PDF and HTML. There’s also text-to-speech and RSS reader, which are good features to have. Onboard storage is 2-4GB and it is expandable via an SD card slot. There’s a 3.5mm headphone out and a USB port too. The 0.35inch thinness is pretty impressive and Asus is even considering putting in WiMax into that frame. There’s already WiFi and HSDPA built in. The eInk screen has a touch-sensitive layer on top of it, so there are concerns about the display losing some clarity and readability. The rumors about the DR-570 refuse to die down however and Digitimes insists that Asus will ship two readers and not one. The current time frame is Q2 2010, so we will know soon. The OLED screen will definitely be no match for the eInk screen in terms of battery life and readability but it will be able to display color and video. So it will likely be a color eBook reader. It must be kept in mind that Asus also has a tablet device planned. So if they release a touchscreen OLED e-reader, it will definitely cannibalize any market that the Eee Pad has. As for the e-reader competing with the Kindle, it can be safely assumed that there is no way Asus can catch the Kindle bookstore and the International Kindle’s free wireless anywhere in the world. So Asus has to be satisfied with only a niche market. The Kindle edition of Dan Brown’s The Lost Symbol seems to be outselling the Hardcover edition of Dan Brown’s The Lost Symbol as was first discovered by Kindle Nation Daily. At the time I’m writing this, the Kindle version is still ahead on Amazon’s sales charts. The main thing to take away from this is the growing power of the Kindle and other eReaders. 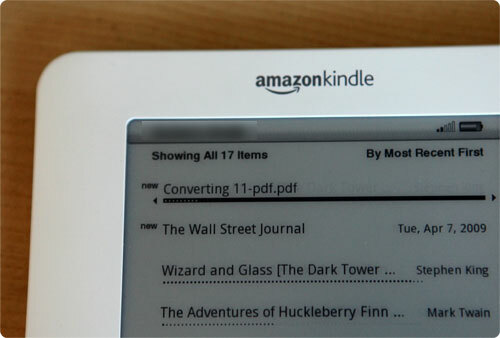 Having the Kindle sales best the physical sales is the latest step in publishing’s gradual move towards digital media. If more books follow suit, and the gap between digital and hardcover sales widen, digital versions will slowly begin to take precedence over printed ones. I’m going to guess that hardcovers will be the first victims of eBooks, eventually being limited to small, collector-oriented runs. Of course, the Kindle edition’s success needs to be taken with a grain of salt. Amazon sales charts are updated frequently, so whoever hasn’t necessarily sold more copies overall. In this case, preorders for the hardcover started earlier than preorders for the eBook, somewhat skewing the results. I’m not saying that this means the Kindle version didn’t sell more, but it is something to consider. Also, hardcovers never sell anything close to paperback numbers, which may be much higher than the Kindle sales once they become widely available. But, at least for now, the Kindle is dominating in the Amazon book store. Another interesting thing about The Lost Symbol is that it has been made widely available by pirates in ePub and PDF forms. 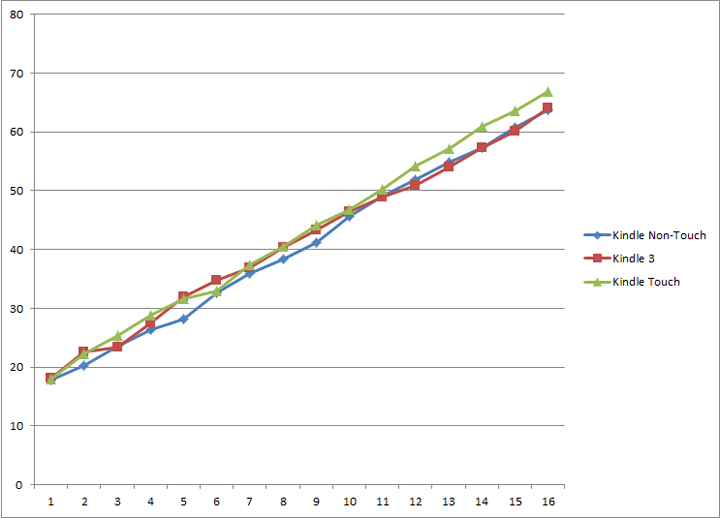 But this didn’t stop the eBook version from outselling the hardcover. This proves my point that people would follow the path of the least resistance. In the case of Kindle buying is easier than stealing so they buy. Back in the time of Audiogalaxy.com it was far easier to download the newly released album (without leaving your home) several days before it hit the stores (that you have to visit in person or wait for several more days before it’s delivered) so people pirated like crazy. Therefore the ease of purchase that is central to Amazon Kindle is the strongest form of DRM. One PDF or ePub file is dropped into /documents folder background conversion process is started automatically and after some time a converted document appears in it’s place. I installed and tested it and it took just under 2 minutes to convert project Gutenberg version of “Alice’s Adventures in Wonderland”. There were some formatting flaws but overall book converted well. This hack is fully reversible. There is an uninstaller provided. However it should be noted that because of the way uninstaller currently works, if you have other hacks installed (like unicode hack or screensaver hack) it can potentially partially revert these as well if they were installed after Savory. So for now it’s safer to uninstall in the reverse order of how you installed hacks. As with all other Kindle hacks it should be used with care because although tested by many people (myself included) it can potentially brick your device. Also having this hack installed will prevent official Amazon updates from installing so you’ll need to uninstall it and the install Amazon update manually. This makes Kindle even more PC-independent than it was to begin with. And this is good. Personally I believe that PC-independent gadgets are the way of the future. Just look at how successful iPhone is (I only need to tether mine to upload new audiobooks and flash new firmware). This is because most people don’t wan’t anymore just to use computers for the sake of using computers but to get done things they need done in their everyday lives and the simpler – the better. Learn how to open PDF file.